I had been to Cincinnati twice before, but both visits surrounded the fact that I am a fan of the city’s baseball team, the Reds. View of downtown Cincinnati from the Carew Building. I attended the 2006 Opening Day game when President George Bush threw out the first pitch, and I also swung through town in June of 2009 for the Civil Rights Game (a game for which Obama declined an invitation to throw out the first pitch). I didn’t spend any time downtown except for the game in either occasion. I don’t think I considered the city dangerous, although I will admit I hadn’t really heard of a reason to poke around. Cincy has been plagued by the riots for over a decade, the Queen City assumed to be armed and dangerous by tourists. And I’ve got to be honest: I can’t really blame them. Read up on the history of what happened, at least the general tensions that surrounded the situation. It’s pretty disturbing what was going on at the time, and the ensuing uncertainty of trust between police and residents cast a dark cloud of crime over the city for the next decade. People left the downtown area, moving out into the suburbs and leaving the bars, restaurants, and shops to crumble. The three or four million dollars worth of damage that occurred in the few days of rioting was nothing compared to the stain it left on Cincinnati’s image and what it would mean for the near future. I don’t say all that to dwell on the past, I say it because I believe the backstory to be important in appreciating the city that stands today. At the risk of sounding dramatic, it’s like watching a person turn his life around. Once down, Cincinnati has worked hard to restore its neighborhoods and has put a lot of time, energy, and cash into some impressive urban redevelopment. The progress is evident, without a doubt. The chicken and egg restoration – the quandary of needing residents to attract businesses versus the need for businesses to attract residents – is finally beginning to result in a mutual trust as buildings are refurbished and apartments are renovated. 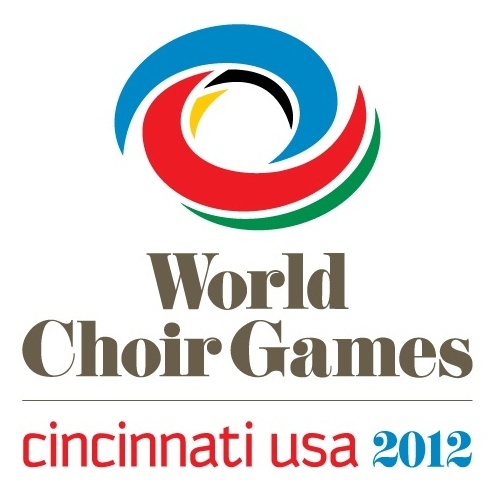 Proof of Cincinnati’s resurgence is evident in its recent hosting of the World Choir Games, a ten-day competition that is considered the “Olympics of choral music.” Close to sixty countries were represented at the Games, the venues and hotels of downtown putting up people from all around the world. I think that speaks very largely about the city – its ability to once again draw international events to its infrastructure. Cincinnati’s Infamous Neighborhood, Over the Rhine (OTR): A canal that once ran through Cincinnati reminded German immigrants of the Rhine River in their homeland, prompting them to refer to the area north of the canal as “Over the Rhine.” That canal no longer exists, but the name still sticks with the neighborhood today. OTR harbors the majority of the city’s art organizations and, according to the OTR Foundation, is comparable both in size and architectural significance to New Orleans’ French Quarter and the historic districts of Charleston and Savannah. It’s also one of the main hubs for nightlife in the city, the section you want to find yourself on a weekend night. Check out the row of bars and restaurants on Vine Street between Central Parkway (the street that was paved above where the canal used to be) and 14th. Neon’s Unplugged at Goetz and 12th is good spot as well, a comfortable, open-spaced backyard type hangout with an outdoor barbecue and a bocce ball court to settle who pays for the next drink. 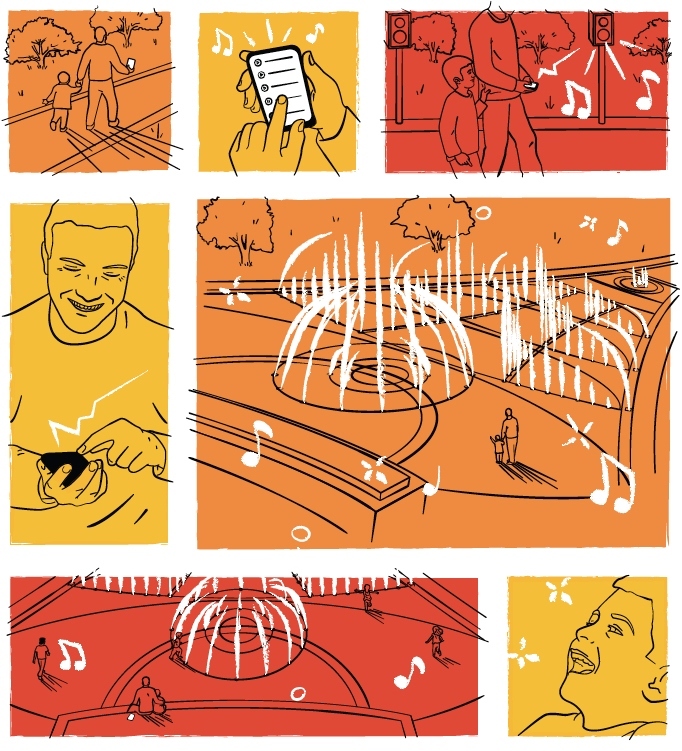 Washington Park graphic promoting the park's new music-driven focus. Washington Park: Located in OTR beside Music Hall and featuring a classical music hall of fame, Wash Park recently reopened after undergoing a $48 million renovation and installing a technology that allows visitors to select classical music via a mobile app to be broadcast over the park’s sound system. The technology does not exist in any other park in the nation, and the new fountain in the park’s center “reacts and dances” to the tempo of the music, most certainly to the delight of the kids cooling off on a summer day. 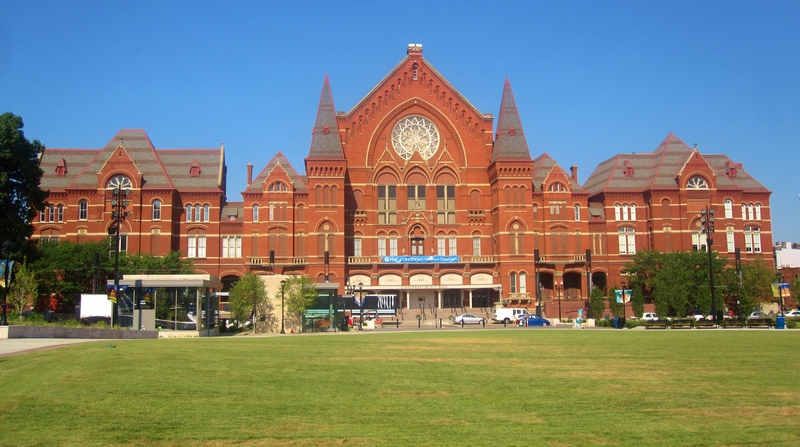 “We saw the potential to bring what happens inside the hall outdoors, to make the concert experience part of the public space,” American Classical Music Hall of Fame Executive Director Nina Perlove told the Cincinnati Enquirer. The goal of the renovations, which also included a playground, dog park, and small concert venue, was to reestablish the park as both a community cornerstone and a social space for families. Tomorrow we’ll take a look at the downtown area as well as some more of the art and cultural aspects of Cincinnati, including thoughts on my visit to the National Underground Railroad Freedom Center. 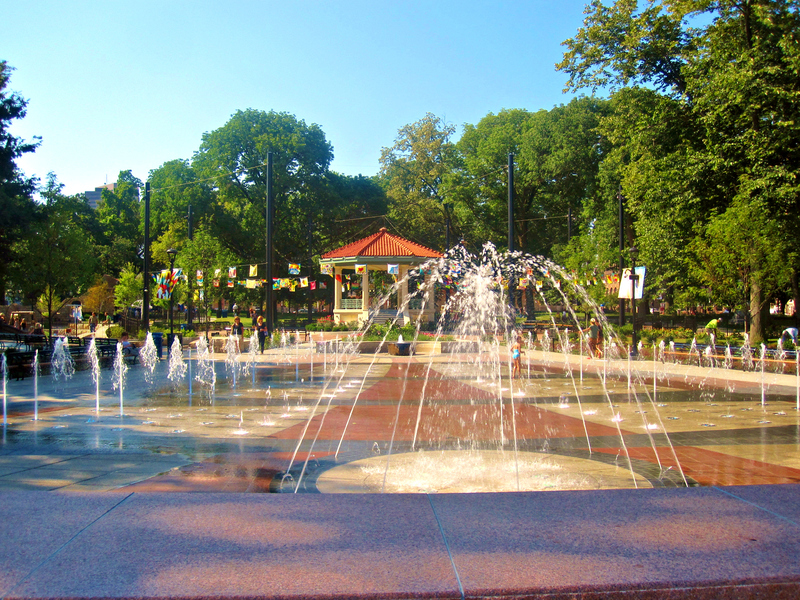 The new fountain at Washington Park in Cincinnati. 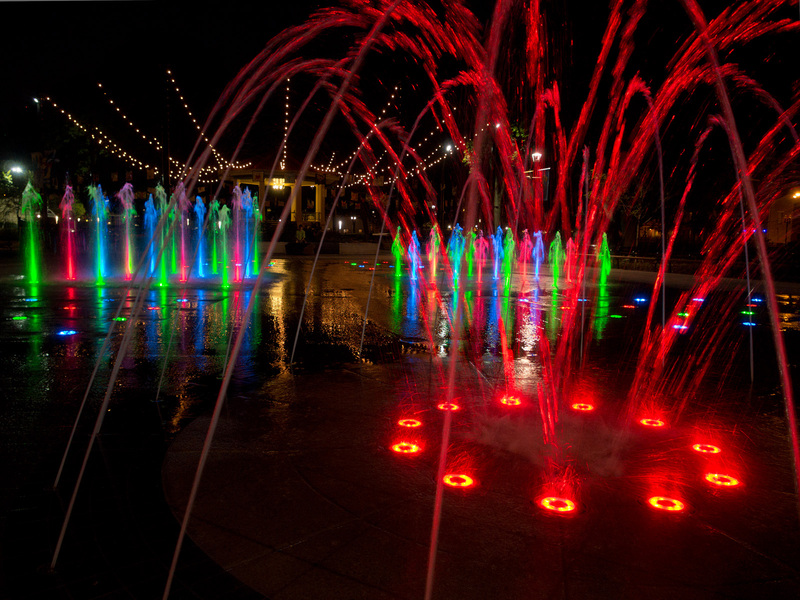 Washington Park fountain at night. Music Hall as seen from Washington Park in Cincinnati. 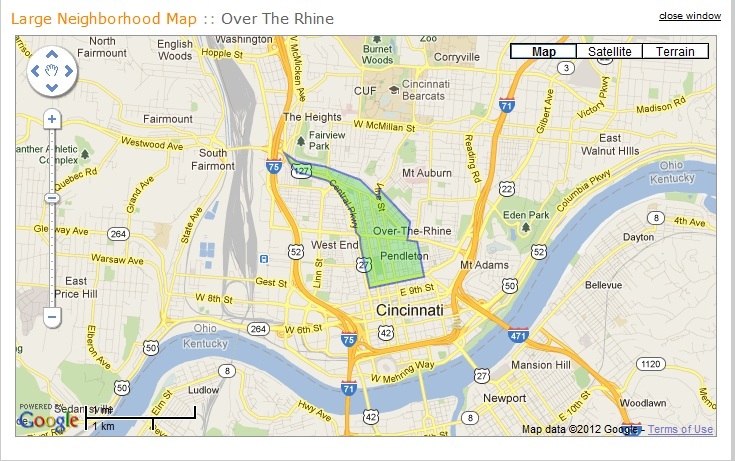 Outline of the OTR neighborhood in Cincinnati.